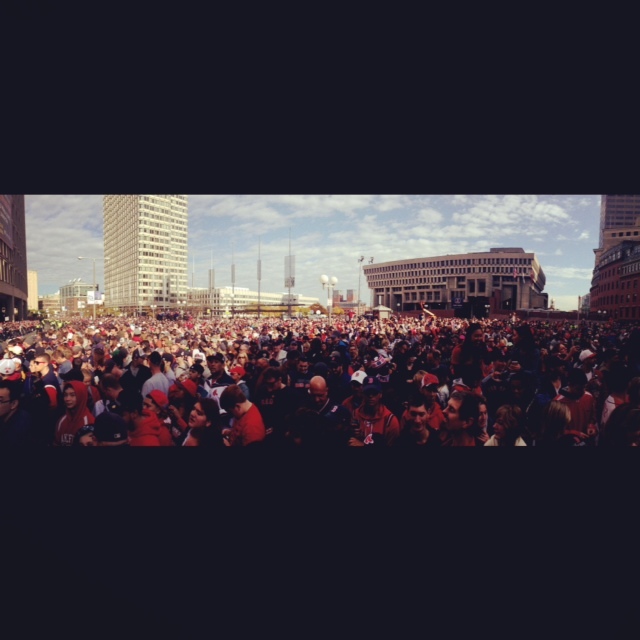 First Championship Parade: Boston Strong! Wednesday night, the Red Sox became world champions for the third time in a decade– dynasty. I was in high school when they won it in 2004 and was living in Tampa when they won it for a second time in 2007. Thankfully, 2013 I’m right here in Boston to be able to get in on all the celebratory action. With any big championship, although you like to hope that it will happen time and time again for years to come, you just never know when the next time will be so I was ready to take on the city and get the full championship craziness. Saturday morning rolled around and I was up at 7 and making bloodies by 730. Great way to start the day. Mike made a delicious breakfast of potatoes and bacon egg and cheeses– meal of champions right there. Finished up breakfast and popped a bottle of champagne because clearly that’s necessary on a day such as this. Overall, champion choices were being made time and time again before 9am. Took the train down to City Hall and the energy was electrifying. Everyone out and about dressed in their red, blue and Sox finest. Not like it doesn’t always, but it felt pretty damn good to be a part of this city. The streets were absolutely packed and buzzing with excitement. The parade had begun and we just had to wait for the Duck Boats to arrive on Cambridge Street. After about an hour or so of waiting, the rolling rally was right in front of us. Mike put me on his shoulders so I could see– which really was necessary, as these 5 foot stumpy legs were not helping my cause of seeing anything past the kid in front of me’s baseball hat. Up on the shoulders I went and I suddenly had the best seat in the house. The boats went by and it was so exciting to wave to all the players and see the trophy in person– so shiny and big, it’s quite the sight. I nearly broke Mike’s neck with the amount I was jumping around up there but I couldn’t help myself– it was like partying with the team, and that, that’s a fun time. 20 minutes later and all that was left on the street was red, white and blue confetti. The parade may have ended but the day certainly did not. The streets were still buzzing and every bar in Boston was absolutely packed– just the way I like it. After about 15 minutes of waiting in line, we headed into Hennessey’s (seems to be my go-to place for big days and nights of drankkkking lately) and continued on a glorious day of beers, wings, singing, friends and laughs. Yesterday reminded me of every reason why I love living in this city. Yes, it may get cold in the winter months and yes, the traffic can be really horrendous at times but the heart of this city is pure perfection. The sports are second to none. The bars and restaurants are absolutely on point. And the people are the most genuine, spirited and big-hearted people you’ll find just about anywhere. There truly is nowhere else in the world I’d rather live. So today, I’m waking up on this cold, rainy Sunday feeling wicked grateful and wicked happy to live in the best city eva, Boston, Massachusetts.